This article is about the British television series. For the Polish punk rock band, see The Bill (band). For the Inside No. 9 episode, see The Bill (Inside No. 9). In its final year on air, The Bill was broadcast once a week, usually on Tuesdays or Thursdays, in a one-hour format. The programme focused on the lives and work of one shift of police officers, rather than on any particular aspect of police work. The Bill was the longest-running police procedural television series in the United Kingdom, and among the longest running of any British television series at the time of its cancellation. The title originates from "Old Bill", a slang term for the police. Throughout its 27-year run, the programme was always broadcast on the main ITV network. In later years, episodes of the show were repeated on ITV3 on their week of broadcast. The series has also been repeated on other digital stations, including Gold, Alibi, Watch, Dave and Drama. The Bill was originally conceived by Geoff McQueen in 1983, then a new television writer, as a one-off drama. McQueen had originally titled the production Old Bill. It was picked up by Michael Chapman for ITV franchise holder Thames Television, who retitled it Woodentop as part of Thames's "Storyboard" series of one-off dramas and was broadcast on ITV under the title Woodentop on 16 August 1983. Woodentop starred Mark Wingett as PC Jim Carver and Trudie Goodwin as WPC June Ackland of London's Metropolitan Police, both attached to the fictional Sun Hill police station. Although originally only intended as a one-off, Woodentop impressed ITV to the extent that a full series was commissioned, first broadcast on 16 October 1984 with one post-watershed episode per week, featuring an hour-long, separate storyline for each episode of the first three series. The first episode of the full series was "Funny Ol' Business – Cops & Robbers". With serialisation, the name of the show changed from Woodentop to The Bill. In its first four years the series was broadcast between July onwards each year, with a 12-week summer break from May until the next July. With a full ensemble cast to explore new characters not featured or just mentioned in Woodentop, the focus of the storylines soon shifted away from new recruit Carver and towards Detective Inspector Roy Galloway and Sergeant Bob Cryer. The series then changed to two episodes, each of 30 minutes on Tuesdays and Thursdays, per week in 1988 (from July 1988 onwards, the series also began being broadcast all year round without a summer break), increasing to three a week beginning in 1993, with the third episode being broadcast on Fridays. In 1998, The Bill returned to hour-long episodes, which later became twice-weekly, with the Friday episode being dropped, at which point the series adopted a much more serialised approach. When Paul Marquess took over as executive producer in 2002, as part of a drive for ratings, the series was revamped, bringing in a more soap opera type feel to many of its stories. Many veteran characters were written out, leading to the Sun Hill fire during 2002. Marquess stated that the clearout was necessary to introduce "plausible, powerful new characters". As part of the new serial format, much more of the characters' personal lives were explored, however, as Marquess put it, the viewers still "don't go home with them". The change also allowed The Bill to become more reflective of modern policing with the introduction of officers from ethnic minorities, most notably the new superintendent, Adam Okaro. It also allowed coverage of the relationship of homosexual Sergeant Craig Gilmore and PC Luke Ashton, a storyline which Marquess was determined to explore before rival Merseybeat. In 2005, Johnathan Young took over as executive producer. The serial format was dropped and The Bill returned to stand-alone episodes with more focus on crime and policing than on the personal lives of the officers. 2007 saw the reintroduction of episode titles, which had been dropped in 2002. In 2009, The Bill moved back to the 9pm slot it previously held and the theme tune, "Overkill", was replaced as part of a major overhaul of the series. On 26 March 2010, ITV announced it would be cancelling the series later that year after 26 years on air. ITV said that this decision reflected the "changing tastes" of viewers. The last episode of The Bill was filmed in June 2010 and broadcast on 31 August 2010 followed by a documentary titled Farewell The Bill. Fans of the show started a 'Save the Bill' campaign on social networking website Facebook in an effort to persuade ITV to reconsider the cancellation, and some radio broadcasters, including BBC Radio 1's Chris Moyles, presented special features on the programme's cancellation. At the time of the series' end in August 2010, The Bill was the United Kingdom's longest-running police drama and was among the longest-running of any British television series. The series finale, entitled "Respect", was aired in two parts and was dedicated to "the men and women of the Metropolitan Police Service past and present". The finale storyline concerned gang member Jasmine Harris being involved in the murder of fellow member Liam Martin who died in the arms of Inspector Smith after being stabbed. Jasmine is then gang raped because she talked to the police and when Callum Stone found the person responsible he was held at gunpoint. Of the title for the finale, executive producer Johnathan Young said "It's called "Respect" and we hope it will respect the heritage of the show". The finale episodes featured all the cast and the final scene was specially written so all cast members would be featured. Following the final episode, ITV aired a documentary entitled Farewell The Bill which featured interviews from past and present cast and crew members. The finale was watched by 4.4 million viewers, with Farewell The Bill averaging 1.661 million viewers. Throughout the series, there have been three filming locations for Sun Hill police station. From the first series, the police station consisted of a set of buildings in Artichoke Hill, Wapping, East London. However, these buildings were next to the News International plant and during the winter of 1985–86 there was much industrial action which resulted in some altercations between the strikers and what they thought were the real police but were actually actors working on The Bill. Working conditions got so dire, that the production team realised they needed to find another base to set Sun Hill police station. The second location was an old record distribution depot in Barlby Road, North Kensington in North West London . Filming began here in March 1987. In 1989, the owners of the Barlby Road site ordered The Bill out, due to their redevelopment plans for the area. After an extensive search, two sites were selected, the favourite being a disused hospital in Clapham. However, this fell through and the second option was chosen – an old wine distribution warehouse in Merton, South West London. The move was made in March 1990 and was disguised on screen by the 'ongoing' refurbishment of Sun Hill police station and then finally the explosion of a terrorist car-bomb in the station car-park, which ended up killing PC Ken Melvin. Sutton Estate, which includes Durand Close in Carshalton, where a housing block regularly used by The Bill for filming was demolished in November 2009. Scenes were often filmed in east London, most notably the London Docklands, with other scenes filmed in Tooting, Greenwich and Croydon. The Bill is set in and around Sun Hill police station, in the fictional "Canley Borough Operational Command Unit" in East London. Geoff McQueen, creator of The Bill, claimed that he named Sun Hill after a street name in his home town of Royston, Hertfordshire. The fictional Sun Hill suburb is located in the fictional London borough of Canley in the East End, north of the River Thames. The Borough of Canley is approximately contiguous to the real-life London Borough of Tower Hamlets, and in the first few years of The Bill, Sun Hill police station was actually stated as being located in Wapping in Tower Hamlets. 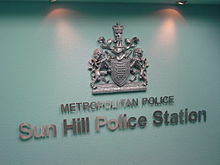 Sun Hill has a London E1 postcode (the 'address' of Sun Hill police station is given as '2 Sun Hill Road, Sun Hill, Canley E1 4KM'. ), which corresponds to the real-life areas of Whitechapel and Stepney. When filming The Bill, some scenes were re-enacted indoors with microphones surrounding the actors and the extra sounds being "dubbed" on later. Some of the more aggressive scenes were also filmed indoors either for dubbing or safety reasons. The sirens used in the series were added later in the dubbing suite as The Bill did not have permission to use them while on location. However, the police uniforms used in the series were genuine, again making The Bill unique amongst police dramas. When the series ended, London's Metropolitan Police Service, after talks with the production company, bought 400 kilograms of police-related paraphernalia, including flat caps and stab vests etc. to prevent them falling into the hands of criminals after the programme's production ceased. The Bill is unique amongst police dramas in that it takes a serial format, focusing on the work and lives of a single shift of police officers, rather than on one particular area of police work. Also unique is that The Bill adapted to this format after several series, whereas comparable series started with the serial format. During its initial broadcast, The Bill was always shown on ITV. In 2009, STV, ITV's regional franchise in Central and Northern Scotland, opted out of broadcasting the series along with a number of other dramas, a decision that later became the subject of legal proceedings between STV and the main ITV network. The legal dispute was settled on 27 April 2011, with ITV receiving £18 million from STV. Aside from repeats of episodes on ITV3, which occurred on the original week of their broadcast, the show has regularly been repeated on other digital stations. Re-runs of the series began on 1 November 1992, when new digital channel UKTV Gold began broadcasting. The channel broadcast repeats of the series for nearly 16 years, until 6 October 2008, when the channel was given a revamp by the owners of the network. During the 16-year period, re-runs of the series covered every episode broadcast between 16 October 1984, and 8 March 2007. On 7 October 2008, UKTV launched a new British drama channel, Alibi, and from this point on, episodes of the series were broadcast at 8am. Alibi broadcast episodes until 23 December 2009, when the show was taken from the channel's schedule due to poor viewer feedback. During the 14 months that the show broadcast on Alibi, the channel covered all of the episodes broadcast between 25 August 1998 and 27 February 2002. On 27 January 2010, UKTV relocated The Bill to one of its more recent entertainment channels, Watch, which began by airing the episode "Sweet Revenge", broadcast on 21 March 2007, continuing in broadcast order, carrying on from where UKTV Gold, had finished. Through the course of the year, the channel continued to broadcast episodes from the latter years of the show, concluding in November 2010 with the episode "Conviction: Judgement Day", broadcast on 16 July 2009. Following a short break from the network, the series returned in December 2010, beginning with Episode #001, broadcast on 28 February 2002. This continued on from the broadcast order of episodes repeated on Alibi, carrying on from where the network had finished. As of April 2012, Watch had repeated every single episode from 28 February 2002 to 24 February 2005, and was to begin airing episodes from March 2005. In July 2013 the show started to be broadcast by UKTV channel Drama, starting with episodes from 1998. On 14 August 2017, Drama started showing The Bill from the beginning. As of 6 November, Drama jumped approximately a decade. On the 5th, it concluded its broadcast of 80s episodes, with 'The Assassins', preferring the 45-minute episodes with PC Santini and WPC Fox. The Bill has been broadcast in over 55 different countries. In Australia The Bill was shown on the ABC. The final episode was shown on 16 October 2010, with Farewell The Bill shown the following week on 23 October. On Wednesday 3 February 2016, ABC commenced repeated the series from the pilot episode until midway through series 7 in an afternoon weekday timeslot, with early-morning repeats. The ABC does not have the rights to show Series 8 to the last episode of Season 26. On pay television services in Australia and New Zealand, older episodes are broadcast on UKTV. The Bill will be again shown on ABC TV from series 1 from the 4 July 2017 in the 5.00 AM time slot. In Denmark the series was retitled "Lov og Uorden" (Law and Disorder). Two episodes of the series were broadcast every afternoon on TV2 Charlie. In Ireland the series was broadcast on RTÉ television, first starting in the early 1990s on RTÉ Two, and in the early 2000s RTÉ began broadcasting it on RTÉ One at 5:30 pm each weekday, splitting hour long episodes into two-part half-hour episodes. RTÉ discontinued this in 2009, moving the show to Monday Nights on RTÉ Two. RTÉ showed episodes from 2005. AIn 2010 RTÉ moved the show from its prime time slot on RTÉ Two to a midnight slot on RTÉ One on Thursday nights, but the show remained on the RTÉ Player. In Sweden the series was retitled "Sunhills polisstation" (Sun Hill Police Station) by broadcaster TV4. In 2011 it was broadcast daily on Kanal 9 in the early afternoon with a repeat early the following morning. The pilot episode of the series, Woodentop, featured a short theme composed by Mike Westergaard. The theme was used specifically for the episode and was never used at any time during the main series. The title sequence for the episode consisted simply of the word Woodentop being spelt out letter by letter, as if someone was writing it on a typewriter. The first ever opening sequence of The Bill was first seen in the episode "Funny Ol' Business – Cops & Robbers". The sequence consisted of two police officers, one male and one female, walking down a street, whilst images of Sun Hill were interspersed between them. This sequence was used for the first series only. It featured the first version of the iconic theme tune, "Overkill", composed by Charlie Morgan and Andy Pask. The theme is notable for its use of septuple meter. The end titles of the series simply showed the feet of the two police constables pounding the beat. In the second series of the show, the opening sequence consisted of a police car, a Rover SD1, racing down a street with its siren wailing and its blue flashing light on. The car would screech to a stop, and the camera zoomed in on the blue light. Various clips were then shown from the series of the characters in action, often chasing suspects. This sequence kept the first version of "Overkill", and also used the same ending credits from series one. This sequence was also used in the third series. From the fourth series onwards, the opening sequence was kept generally the same; however, clips from the series used were regularly updated to remove departed characters and keep to date with the show's events. Minor changes to the sequence included the Rover SD1 changing into a Ford Sierra in 1993, which was replaced by a Vauxhall Vectra in 1997. In the 1997 sequence, the Vectra was seen overtaking a Leyland Titan bus, before screeching to a halt, and the main sequence starting. The end credits for the series remained the same, but a new version of "Overkill" was used, also composed by Andy Pask and Charlie Morgan. On 6 January 1998, starting with "Hard Cash", the third episode of the show's 14th series, the title sequence and theme used for nearly 10 years were scrapped. This time, the title sequence consisted of various police procedural images, including a suspect being shown into a police cell, another suspect being interviewed, and a third posing for mug shot photographs. Clips of any of the actors featured were removed, as was the initial sequence involving the police car racing down the street. Pask and Morgan revamped "Overkill", giving it a jazz feel, with the majority of the theme played by a saxophone. The end credits of the series were also completely revamped. This time, the credits featured various images of the Metropolitan Police uniform, combined with images of a feet tapping on a kerb. A longer version of "Overkill" was also used in the final credits, this time composed by Mark Russell. These opening and closing sequences were used for nearly three years, although both saw minor updates on 11 February 1999. The text sequence at the very start of the opening sequence was changed into a different font, and the images of the police uniform and feet tapping on a curb were removed from the closing sequence to make way for a preview of the next episode. The closing sequence remained this way until 16 February 2001, but the opening titles were once again updated in September 2000 to remove certain images from the sequence to make it shorter. It is also noted that during this period, a 'previously on The Bill' segment was aired before the title sequence, to inform views what had occurred in the last episode. On 20 February 2001, starting with "Going Under", the 14th episode of the show's 17th series, the opening and closing sequences were once again scrapped to make way for a completely new sequence and theme. This time, the opening sequence consisted of a montage image of the entire cast, backed by a darker, slower version of "Overkill". The closing credits featured a montage of various police-related images, also backed by the new version of "Overkill". The opening sequence was designed by the visuals company "Blue", and the new arrangement of "Overkill" was produced by Miles Bould and Mike Westergaard. These titles remained essentially the same for two years, with two small updates. The font used on the closing credits was changed towards the end of 2001, and the characters featured in the opening sequence were updated in May 2002, to remove characters who had departed, and include new characters. These titles were broadcast from Episode No. 017, and are notable as several of the characters in these titles had not yet appeared in the show. DS Samantha Nixon appeared in the titles from Episode No. 017, but did not first appear until Episode No. 038, some four months later. On 26 February 2003, starting with Episode No. 091, the opening and closing sequences were once again updated. This time, the opening sequence consisted of several generic police images, such as a police car and uniform. A new arrangement of "Overkill", made by Lawrence Oakley, was also used for both the opening and closing sequences. The background of the closing sequence, designed by company "Roisin at Blue", was simply a police shade of blue, with all generic images being removed. Throughout its four-year use, these titles were never updated or changed, with the exception of the police shade of blue, which was changed to a dark shade of black in 2006. On 3 January 2007, starting with Episode No. 471, the opening and closing sequences were once again changed. This time, the opening sequence, for the first time, features an image of the Sun Hill sign, and returns to featuring images of officers in action. This sequence also featured a further new arrangement of "Overkill", once again arranged by Lawrence Oakley. This time, the closing sequence follows a police car on patrol, watching it as it drives through the streets of Sun Hill. These titles were used for nearly two and a half years. On 23 July 2009, after the programme underwent a major overhaul, the opening sequence and theme were heavily changed. This time, the classic "Overkill" theme was completely removed, and a new theme created by Simba Studios was used. However, producer Jonathan Young stated that echoes of "Overkill" can still be heard in the theme. The opening sequence featured a patrol car driving through the streets of Sun Hill. The closing sequence follows the same patrol car, however, this time, from an overhead view. These titles remained the same until the show's final episode, where the theme tune was replaced by a final version of "Overkill", in homage to the show. When The Bill was first commissioned as a series by ITV, it started with 12 episodes per year, each an hour long with a separate storyline. In 1988 the format changed to year-round broadcast with two 30-minute episodes per week. In 1993 this expanded to three 30-minute episodes per week. In 1998 the broadcast format changed to two one hour episodes each week. Episodes were now recorded in 16:9 widescreen Digibeta. In 2009 The Bill began broadcasting in HD and as part of a major revamp, was reduced to broadcasting once a week. The Bill finished in 2010, with 2425 episodes broadcast. The Bill has broadcast two live episodes. The first was in 2003 to celebrate the 20th anniversary of the pilot, Woodentop. The second was in 2005 to celebrate the 50th birthday of ITV. The live episode in 2003 was episode No. 162, originally broadcast on 30 October 2003 at 8pm, and produced with a crew of 200 staff including seven camera crews. It was reported to be the first live television broadcast of a programme where filming was not largely confined to a studio. Detective Constable Juliet Becker and Constable Cathy Bradford are being held hostage by a man called Mark in a van in the station yard. Bradford raises the custody suite alarm. When the rest of the station arrive outside, Mark makes it known that he intends to kill Becker. The police get permission to break into the carrier, only to find that Juliet has been stabbed. She is rushed to hospital, but attempts to resuscitate her fail. The episode was watched by around 11 million viewers. This special was later released onto DVD in United Kingdom 31 October 2011, as part of Network DVD's "Soap Box: Volume 1". The live episode in 2005 was episode No. 349, broadcast on 22 September 2005 at 8pm. In this episode, it was revealed that PC Gabriel Kent had assumed a false identity. It is revealed that he has been operating under his brother's name and is, in fact, David Kent. In this episode the "real" Gabriel Kent arrived in Sun Hill to meet his mother, Sergeant June Ackland. In this episode, Sun Hill police station is hosting a reception party and, as the police arrive, they are taken hostage by a distraught father whose son was killed by a stolen car. A struggle ensues in which a shot is fired, alerting others in the building the incident. After an evacuation of the station, Superintendent Amanda Prosser encourages PC Dan Casper to attempt to overpower the man. As he does so, both Casper and the real Gabriel Kent are shot. The real Gabriel Kent is rushed to hospital where the false Gabriel Kent threatens him to keep the identity switch a secret. A series of special episodes titled The Bill Uncovered were produced to reflect the stories of select characters and events. The first was The Bill Uncovered : Des and Reg (2004) – The story of the unusual friendship between PC Des Taviner and PC Reg Hollis, traversing their history from Des's first day at Sun Hill to his death in a Sun Hill cell. The second was The Bill Uncovered : Kerry's Story (2004), the story of PC Kerry Young, who met her death outside Sun Hill. The third special was The Bill Uncovered : Jim's Story (2005), the story of DC Jim Carver – from his first day at Sun Hill (in the pilot "Woodentop"). The last was The Bill Uncovered: On The Front Line (2006), in which Superintendent Adam Okaro recounts the extraordinary events that have surrounded Sun Hill over his time in charge. A review of the second of these specials criticised the "increasingly degenerative plotlines" of the series, and characterised the special as a "cheerless outing" covering The Bill's "travesties of plot". All four editions of The Bill Uncovered were released on DVD in Australia as part of The Bill Series 26 DVD boxset, 30 April 2014. In 2008, a special programme called "The Bill Made Me Famous" in light of the show's 25th anniversary was broadcast, which saw former actors and special guest stars telling their accounts of working on the show and how it changed their lives. It included old favourites such as Billy Murray (DS Don Beech), Chris Ellison (DI Frank Burnside) and popular TV personalities such as Paul O'Grady and Les Dennis. A two-part crossover episode with the German series SOKO Leipzig, entitled "Proof of Life", was broadcast in November 2008. Following The Bill's final episode on 31 August 2010, a one-hour special titled Farewell The Bill was broadcast. The special explored the history of the series and gave viewers a behind the scenes look at the filming of the last episode. This special was later released onto DVD in Australia 5 October 2011, along with the last two-part episode "Respect". The Bill had a large regular cast to support the number of episodes that were produced each year. Working on The Bill had become something of a comical joke in British acting, with 174 actors having formed part of the series' main cast since the series began. A number of cast members have played multiple roles in the series, and in other British soap operas and dramas. There are numerous actors who have either appeared on The Bill for some considerable length of time, or on whose careers The Bill has made a significant impact. The following is a concise list of the most notable, an expanded version is available at List of characters of The Bill. Billy Murray played DS Don Beech from 1995 to 2004. The character was a cold police officer, notably having murdered DS John Boulton, forcing Beech to go on the run, sparking the "Don Beech scandal". Since leaving The Bill, Murray's career has included a stint on EastEnders as gangster and murderer Johnny Allen and two films, Rollin' With The Nines and Rise of the Footsoldier. The character also spawned Beech on the Run and Beech is Back. Tony O'Callaghan played Sergeant Matt Boyden from 1991 to 2003. Boyden was shot dead by his daughter's boyfriend so she could profit from insurance money to fund her drug habit. This was the storyline that formed the basis for the opening episode of spin-off M.I.T. : Murder Investigation Team. O'Callaghan has also appeared in The Magnificent Evans, Family Affairs, Holby City, Doctors, EastEnders and Shameless. Christopher Ellison played DS Tommy Burnside in episode one and later returned as DI, later promoted to DCI, Frank Burnside from 1984 to 2000. Burnside made many enemies both at Sun Hill and with the villains, indeed Chief Superintendent Pearson tried to frame Burnside in a corruption inquiry. Since leaving The Bill, Ellison has enjoyed a guest stint as Len Harker in EastEnders. Ellison has also appeared in The Professionals, Minder, Casualty, Judge John Deed and voiced a Doctor Who audio adventure. The character spawned a spin-off, Burnside. Mark Wingett played PC, then DC, later promoted to DS, Jim Carver from 1983 to 2007. After his marriage to June Ackland collapsed and he built up gambling debts, the character left Sun Hill. Since leaving, Wingett has also appeared in EastEnders. Eric Richard played Sergeant Bob Cryer from 1984 to 2001, the character leaving after being injured when he was accidentally shot by then PC Dale Smith. The character later made brief re-appearances in the series, including in one storyline involving his niece Roberta who later joined the station. Prior to appearing in The Bill, Richard appeared in a number of TV programmes including Open All Hours, Made in Britain and Shoestring. Kevin Lloyd played DC Tosh Lines from 1988 to 1998. The character was written out as having accepted a position in the Coroner's Office after Lloyd was sacked for turning up for work drunk. Lloyd died a week after his dismissal. Jeff Stewart played PC Reg Hollis from 1984 to 2008. The character was written out after resigning under the grounds of being traumatised by the death of colleagues in a bomb blast. After learning of his axing from the show, Stewart attempted suicide on set by slashing his wrists. Graham Cole played PC Tony Stamp from 1987 to 2009. The character was written out of the series, taking up a driving instructor's post at Hendon, as part of the show's revamp, after producers felt that he didn't fit the style of the new show. Cole's last episode was shown on 5 November 2009 and his departure meant the end of a 22-year association with the programme. Trudie Goodwin played PC, later promoted to Sergeant, June Ackland from 1983 to 2007, appearing first in Woodentop. The character retired in 2007 after her on-screen relationship with DC Jim Carver came to an abrupt end. When Goodwin left The Bill in 2007 she was not only the longest serving cast member in the history of The Bill, but also held the world record for the longest time an actor has portrayed a police character. Simon Rouse played DCI, later promoted to Superintendent, Jack Meadows from 1989 to 2010, though the character only became a regular role in 1992. Aside from The Bill, Rouse has had small appearances in a number of other British television series including Robin of Sherwood, The Professionals, Casualty, Minder and Doctor Who. Chris Simmons played DC Mickey Webb from 2000 to 2010. He appeared twice on the show playing different roles, most notably as a criminals in 1998-99, before joining the cast as a regular in the following year. He left the series temporarily in 2003, as the culmination of a storyline where his character was raped. He made several guest appearances before returning as a regular in 2005. The constant need for minor characters, normally appearing in only a single episode, inevitably led to numerous high-profile actors and actresses having guest roles in The Bill. The following actors appeared in the show at least once. The Bill was a popular drama in the United Kingdom and in many other countries, most notably in Australia. The series attracted audiences of up to six million viewers in 2008 and 2009. Ratings during 2002 peaked after the overhaul of the show which brought about the 2002 fire episode, in which six officers were killed, and the 2003 live episode attracted 10 million viewers — 40% of the UK audience share. Immediately following The Bill's revamping and time slot change, it was reported that the programme had attracted 4.5 million viewers, 19% of the audience share, but it lost out in the ratings to the BBC's New Tricks, with the Daily Mirror later reporting that ITV's schedule change was behind a two million viewer drop in ratings. In 2001, prior to Paul Marquess's appointment as executive producer, ratings had dropped to approximately six million viewers, and advertising revenues had fallen, in part due to the ageing demographic of its viewers, leading ITV to order a "rejuvenation", which saw the series adopt a serial format. In 2002, The Independent reported that The Bill's Thursday episode was viewed by approximately 7 million people, a fall of approximately 3 million viewers in the space of six months. After the cast clearout resulting from the Sun Hill fire in April 2002, BBC News reported that the show attracted 8.6 million viewers, the highest figure for the year to that point, and by October 2003, the program had around 8 million viewers each week. In 2005, The Bill was averaging around 11 million viewers, in comparison to Coronation Street, which was attracting around 10 million viewers. In 2009, The Daily Mirror reported that The Bill was to be moved to a post-watershed slot to allow it to cover grittier storylines. It was reported that it was the first time in British Television that ITV had broadcast a drama all year in the 9pm slot. The changeover happened at the end of July 2009. Before the move, the program was averaging 5 million viewers between the two episodes each week. BARB reported that the week of 12–18 October 2009 saw 3.78 million viewers watch the show. The Bill has achieved a number of awards throughout its time on air, ranging from a BAFTA to the Royal Television Society Awards. and the Inside Soap Awards, particularly the "best recurring drama" category. In 2010, The Bill was nominated for a Royal Television Society award for Best Soap/Continuing Drama, beating both Coronation Street and Emmerdale on to the nominations list. The only soap to be nominated was EastEnders and the results were announced on 16 March 2010. In 2009 an episode of The Bill won the Knights of Illumination Award for Lighting Design- Drama. It has been compared to Hill Street Blues due to the similar, serial, format that both series take. However, The Bill has seen little direct competition on British television in the police procedural genre over its 25-year history, though the BBC has twice launched rival series. The first was Merseybeat, which ran from 2001 but was cancelled in 2004 due to poor ratings and problems with the cast. The second, HolbyBlue, launched in 2007, was a spin-off of successful medical drama Holby City (itself a spin-off of the long-running Casualty). It was scheduled to go "head to head" with The Bill, prompting a brief "ratings war" but, in 2008, HolbyBlue was also cancelled by the BBC, again, largely due to poor ratings. When The Bill started, the majority of the Police Federation were opposed to the programme, claiming that it portrayed the police as a racist organisation, but feelings towards the programme later mellowed, to the extent that, in 2006, executive producer, Johnathan Young, met Sir Ian Blair, then Commissioner of the Met, and it was decided that the editorial relationship between the police and the programme was sufficient. However, Young stressed that The Bill is not "editorially bound" to the police. Despite better relations with the police, The Bill was still not without controversy. It was sometimes criticised for the high levels of violence, especially prior to 2009, when it occupied a pre-watershed timeslot. Specific story lines also came under fire in the media, such as that involving a gay kiss in 2002, as well as an episode broadcast in March 2008 which featured a fictional treatment for multiple sclerosis, leading the MS Society to brand the plot "grossly irresponsible". The series was also criticised by the tabloid press for replacing the iconic theme tune as part of a revamping effort. During its 27-year-run, The Bill spawned several spin-off productions and related series in German and Dutch languages, as well as a series of documentaries. The following is a list of the most notable of these. Bureau Kruislaan: Dutch interpretation of the series. Produced by Joop van den Ende for VARA Television, the programme lasted for four series running from 1992 to 1995. In 1995, the show was nominated for the Gouden Televizier Ring, an award for the best television programme in the Netherlands. All four series of the show have been released on DVD there. Die Wache: German interpretation of the series. As decent script-writers were hard to find at the time, the German producers were given the licence to utilise (re-use) scripts from the British series. The series was produced by RTL Television, running for nearly 250 episodes from 1994 to 2006. Burnside: Spin-off from the main British series, following ex-DI Frank Burnside in his transfer and promotion to the National Crime Squad. The programme lasted for just a single series of six episodes, debuting in the UK on 6 July 2000. The series was created and produced by Richard Handford. On 8 October 2008, the series was released on DVD in Australia in a three-disc-set. MIT: Murder Investigation Team: Spin-off from the main British series. Lasting for two series, the drama began with a group of MIT officers investigating the drive-by shooting of Sgt. Matthew Boyden, who had been at Sun Hill for eleven years. The first series consisted of eight one-hour episodes. The second series consisted of four ninety-minute episodes. The series was created by Paul Marquess, produced by Johnathan Young and starred ex-Bill DS Eva Sharpe (Diane Parish). Clothes Baseball Cap – black, embroidered with The Bill logo. Beanie Hat- black, embroidered with The Bill Logo. Fleece – black, embroidered with the Bill Logo. Polo Shirt – black, embroidered with the Bill logo. T-shirt – black, embroidered with the Bill logo. Waterproof Jacket Sydney Jacket – embroidered with the Bill logo. Toys Land Rover – The Bill Landrover 4x4, (scale 1:43). Police Car – The Bill Omega Police Car, 11.5 cm (scale 1:43). Police Van – The Bill Van. Police Helicopter – working with light and sound, also includes 30 cm action figure and accessories. Police Van and Traffic Officer – working with light and sound, also includes 30 cm action figure and accessories. Action Figures Male PC "12" – with accessories, includes duty belt. Female Sergeant – with radio and duty belt. – with accessories, includes duty belt. Public Order PC – with watch, truncheon, handcuffs, fire extinguisher and duty belt. Traffic Sergeant – with extendable truncheon, radio, flat hat, watch and duty belt. Miscellaneous Silver-plated keyring – 20th Anniversary collector's edition. Umbrella – with The Bill logo. Watch – with The Bill logo and Velcro Strap. Back pack – Embroidered with The Bill logo. Mug – white with The Bill logo. Thermal Mug – Black with The Bill logo. ^ "Police drama The Bill enjoys revival on UKTV Play | News | UKTV Corporate Site". corporate.uktv.co.uk. Retrieved 22 December 2018. ^ a b c d e f g h i j k l m n o Tibballs, Geoff (November 2003). "Introduction". The Bill: The Official History of Sun Hill. Carlton. p. 10. ISBN 978-1-84442-667-6. ^ a b c "The Bill prepares for live birthday". BBC News. 30 October 2003. Archived from the original on 18 August 2012. Retrieved 1 December 2009. ^ a b c "The Bill: Changing Times". Associated Television. Archived from the original on 9 October 2011. Retrieved 13 November 2009. ^ a b Allen, Nick (23 January 2009). "The Bill cut to one episode a week as ITV seeks to reduce costs". The Daily Telegraph. London. Archived from the original on 5 June 2011. Retrieved 28 October 2009. ^ Sweney, Mark (26 March 2010). "The Bill: ITV drops police drama after 27 years". The Guardian. London. Archived from the original on 29 March 2010. Retrieved 26 March 2010. ^ Lawson, Mark (26 March 2010). "The Bill killed off due to ratings slump". The Guardian. London. Archived from the original on 3 April 2015. Retrieved 29 March 2010. ^ "ITV axes 'The Bill'". The Independent. London. 26 March 2010. Archived from the original on 29 March 2010. Retrieved 26 March 2010. ^ "Television series 'The Bill' to conclude this year". australia-times.com.au. 28 March 2010. Archived from the original on 11 September 2012. Retrieved 28 March 2010. ^ "The Bill". ITV plc. 29 August 2010. Archived from the original on 23 August 2010. Retrieved 29 August 2010. ^ "Nearly 5000 join Facebook Group to save The Bill". Associated Television. 29 March 2010. Archived from the original on 9 October 2011. Retrieved 29 March 2010. ^ Dyke, Peter; Katie Begley (1 April 2010). "Fans battle to save The Bill". Daily Star. Northern and Shell. Retrieved 4 April 2010. ^ Sweney, Mark (26 March 2010). "The Bill: ITV drops police drama after 27 years". The Guardian. London. Archived from the original on 29 March 2010. Retrieved 30 August 2010. ^ George, Martin (1 September 2010). "Kingston's Cambridge Road estate says farewell to The Bill". Surrey Comet. Newsquest. Archived from the original on 3 September 2010. Retrieved 1 September 2010. ^ "The Bill comes to an end after 27 years as final episode airs tonight". Daily Mail. London. 31 August 2010. Archived from the original on 20 April 2013. Retrieved 31 August 2010. ^ Scott, Elizabeth (31 August 2010). "TV Police Drama The Bill Airs Final Episode After 27 Years". Sky News. Archived from the original on 2 February 2013. Retrieved 31 August 2010. ^ Plunkett, John (1 September 2010). "The Bill finale wins 4.4m viewers". The Guardian. London. Archived from the original on 28 October 2014. Retrieved 1 September 2010. ^ Bridge, Carl (2004). "Australia's Britain". Meanjin. 63 (3–4): 218. ^ Whitley, David. "British Television Filming Locations". Worldwide: travel.nine. Archived from the original on 17 November 2009. Retrieved 26 November 2009. ^ "Filming in Merton". United Kingdom: Merton Council. Archived from the original on 4 April 2010. Retrieved 26 November 2009. ^ "Extract from Hansard Assembly" (PDF). 20 May 2004. Archived (PDF) from the original on 1 April 2011. Retrieved 19 September 2010. ^ Fender, Leanne (21 November 2009). "Sad Goodbyes as Sutton Estate is Demolished for Revamp". United Kingdom: Surrey Comet. Archived from the original on 20 July 2011. Retrieved 26 November 2009. ^ Virtue, Rob (6 August 2009). "The Bill Answers the Call of the Dark Side". London: wharf. Archived from the original on 3 October 2011. Retrieved 27 October 2009. ^ Broadway, Tooting (12 November 2008). "The Bill Filming in Tooting". London. Archived from the original on 21 February 2010. Retrieved 27 October 2009. ^ Truman, Peter (27 January 2009). "Filming in Croydon". Croydon: croydonguardian.co.uk. Archived from the original on 20 June 2009. Retrieved 27 October 2009. ^ March, Ian; Gaynor Melville (2009). Crime, Justice and the Media. London: Taylor & Francis. p. 138. ISBN 978-0-415-44490-3. ^ "The Bill Behind The Scenes". London: ITV. 2 April 2009. Archived from the original on 4 January 2010. Retrieved 26 October 2009. ^ a b Tibballs, Geoff (September 2004). "The Chandler Years". The Bill: The Official History of Sun Hill. ISBN 978-1-84442-667-6. ^ a b c Sharp, Rob (1 September 2008). "The Bill and The Police". The Independent. London. Archived from the original on 7 May 2009. Retrieved 26 October 2009. ^ a b Rogers, Margaret (1 January 2005). "It's a fair cop, guv: Australian fans of The Bill". Journal of Australian Studies. Retrieved 1 November 2009. ^ Sweney, Mark (27 April 2011). "STV comes to £18m settlement with ITV". The Guardian. Archived from the original on 28 April 2014. Retrieved 23 February 2013. ^ "BBC NEWS". BBC. 13 August 2004. Archived from the original on 10 August 2017. Retrieved 3 April 2011. ^ "Crime". Drama Channel. Archived from the original on 26 July 2013. Retrieved 18 July 2013. ^ "The Bill will be cutback to one episode per week". Edinburgh: STV. 23 January 2009. Archived from the original on 17 July 2011. Retrieved 9 November 2009. ^ Knox, David (14 October 2010). "Farewell The Bill :TV Tonight". TV Tonight. Archived from the original on 16 October 2010. Retrieved 14 October 2010. ^ "Lov og uorden på TV2 Charlie". TV2. Archived from the original on 7 May 2012. Retrieved 3 May 2012. ^ Oatts, Joanne (9 October 2007). "RTE Secures Neighbours Deal". Digital Spy. United Kingdom. Archived from the original on 6 October 2010. Retrieved 1 December 2009. ^ "RTÉ Player: Catch up with your favourite TV programmes online". Raidió Teilifís Éireann. Archived from the original on 20 August 2011. Retrieved 5 July 2010. ^ "The Bill – www.tv.nu". Kanal 9. Archived from the original on 8 November 2011. Retrieved 3 May 2012. ^ ""The Bill" Funny Ol' Business – Cops & Robbers (1984)". Internet Movie Database. Archived from the original on 7 November 2015. Retrieved 13 November 2009. ^ "The Bill original ending credits". London: TheDoctor001. Archived from the original on 31 July 2013. Retrieved 27 October 2009. ^ a b Gauntlett, David; Hill, Annette (2000). TV living: television, culture, and everyday life. ebrary, Inc. pp. 297, 298. ISBN 978-0-415-18486-1. Retrieved 28 October 2009. ^ McCann, Mick (11 October 2012). "TV and radio blog + The Bill". The Guardian. Retrieved 23 February 2013. ^ "The Bill 1998–2001 Opening Credits". London: TheBillTitles. 2009. Archived from the original on 25 July 2013. Retrieved 27 October 2009. ^ "Mark Russell". United Kingdom: Internet Movie Database. Archived from the original on 29 July 2012. Retrieved 3 November 2009. ^ Leitch, Lyn. "1998–2001 Closing Credits". London: lynleitch. Archived from the original on 28 July 2013. Retrieved 27 October 2009. ^ "The Bill 2001–2002 Opening Credits". London: TheBillTitles. 2009. Archived from the original on 31 July 2013. Retrieved 27 October 2009. ^ "Miles Bould". United Kingdom: Internet Movie Database. Archived from the original on 21 January 2016. Retrieved 3 November 2009. ^ "Mike Westergaard". United Kingdom: Internet Movie Database. Archived from the original on 4 July 2004. Retrieved 3 November 2009. ^ "The Bills Closing Credits 2001–2002". London: lynleitch. 2008. Archived from the original on 1 August 2013. Retrieved 27 October 2009. ^ "The Bill 2006 Opening and Closing Credits". London. 2006. Archived from the original on 31 July 2013. Retrieved 27 October 2009. ^ "The Bill 2007–2009 Opening Credits". London: TheBillTitles. 2009. Archived from the original on 31 July 2013. Retrieved 27 October 2009. ^ "The Bill 2007–2009 Closing Credits". London: TheBillTitles. 2009. Archived from the original on 26 July 2013. Retrieved 27 October 2009. ^ "The Bill is slashed to one episode a week". Daily Mail. London. 23 January 2009. Archived from the original on 20 April 2013. Retrieved 28 October 2009. ^ "The Bill Closing Credits 2009". London: TheBillTitles. 2009. Archived from the original on 26 July 2013. Retrieved 27 October 2009. ^ "Who nicked The Bill's theme tune?". The Guardian. London. 23 July 2009. Archived from the original on 25 December 2015. Retrieved 2 November 2009. ^ "The Bill's theme tune to be axed". London: BBC News. 3 July 2009. Retrieved 3 November 2009. ^ McMahon, Kate (2 July 2009). "The Bill introduces incidental music". London: Broadcast Now. Archived from the original on 5 July 2009. Retrieved 27 October 2009. ^ "The Bill Opening Credits 2009". London: BroadcastnowTV. 2009. Archived from the original on 1 August 2013. Retrieved 27 October 2009. ^ Allen, Nick (23 January 2009). "The Bill cut to one episode a week as ITV seeks to reduce costs". The Daily Telegraph. Archived from the original on 13 November 2012. Retrieved 6 May 2012. ^ Debnath, Neela (5 May 2016). "The Bill is one of the most-watched box sets on TV - despite getting axed in 2010". Express.co.uk. Retrieved 22 December 2018. ^ a b c Tate, Stephen (5 November 2003). "Production – TX – The Bill's live challenge". Broadcast. Archived from the original on 1 October 2012. Retrieved 1 December 2009. ^ a b "ITV plans live Bill for 50th". Broadcast. 27 July 2005. Archived from the original on 1 October 2012. Retrieved 1 December 2009. ^ "Soap Box: Volume 1". networkonair.com/. Archived from the original on 5 June 2013. Retrieved 31 January 2013. ^ "Program summary: The Bill Uncovered: Des And Reg". ABC TV Guide. Australian Broadcasting Corporation. October 2005. Archived from the original on 2 September 2012. Retrieved 2 December 2009. ^ a b Faouque, Farah (7 October 2005). "The Bill Uncovered: Kerry's Story". TV & Radio. Archived from the original on 18 November 2008. Retrieved 2 December 2009. ^ "The Bill Uncovered: On The Front Line". ABC TV Guide. Australian Broadcasting Corporation. December 2006. Archived from the original on 23 August 2012. Retrieved 2 December 2009. ^ "THE BILL – SERIES 26". screenpop.com.au. Archived from the original on 14 May 2014. Retrieved 26 May 2014. ^ Armstrong, Stephen (2 November 2008). "The Bill meets SOKO Leipzig". The Times. London. Archived from the original on 16 June 2011. ^ a b Love, Ryan (19 August 2010). "ITV confirms 'Farewell The Bill' special". Digital Spy. Archived from the original on 17 April 2012. Retrieved 6 May 2012. ^ "The Bill: Farewell The Bill". shock.com.au. Archived from the original on 15 September 2012. Retrieved 31 January 2013. ^ The Bill (23 October 2009). "The Bill Current Cast List". London: ITV. Archived from the original on 6 October 2010. Retrieved 26 October 2009. ^ a b "DS Don Beech (Character)". Internet movie Database. Archived from the original on 4 July 2009. Retrieved 16 November 2009. ^ "Character – Johnny Allen". EastEnders. BBC. Archived from the original on 17 September 2009. Retrieved 12 November 2009. ^ "Billy Murray (I)". Internet Movie Database. Archived from the original on 26 July 2010. Retrieved 16 November 2009. ^ "Sgt. Matthew Boyden (Character)". Internet Movie Database. Archived from the original on 24 September 2014. Retrieved 16 November 2009. ^ "Tony O'Callaghan (I)". internet Movie Database. Archived from the original on 11 July 2012. Retrieved 17 November 2009. ^ "D.I. Burnside (Character)". Internet Movie Database. Archived from the original on 2 January 2012. Retrieved 17 November 2009. ^ Tibballs, Geoff (2004). The Bill: The Official History of Sun Hill. Carlton. p. 31. ISBN 978-1-84442-667-6. ^ "DC Jim Carver (Character)". Internet Movie Database. Archived from the original on 10 December 2008. Retrieved 17 November 2009. ^ "Eric Richard (I)". Internet movie Database. Archived from the original on 1 July 2011. Retrieved 17 November 2009. ^ Hayward, Anthony (4 May 1998). "Obituary: Kevin Lloyd". The Independent. Britain. Archived from the original on 10 September 2010. Retrieved 31 October 2009. ^ "Sacked Bill Star Reassures Fans". London: British Broadcasting Corporation (BBC). 11 January 2008. Archived from the original on 3 February 2009. Retrieved 31 October 2009. ^ "PC Tony Stamp to leave The Bill". London: BBC News. 5 June 2009. Archived from the original on 8 June 2009. Retrieved 17 November 2009. ^ Deans, Jason (6 November 2009). "The Bill collars 4m for stalwart's low key farewell". The Guardian. London. Archived from the original on 13 April 2014. Retrieved 17 November 2009. ^ "In pictures: The Bill's June Ackland". BBC. 9 March 2007. Archived from the original on 12 January 2008. Retrieved 19 September 2010. ^ "Cops and Clobber". The Guardian. United Kingdom. 8 March 2007. Archived from the original on 13 April 2014. Retrieved 9 November 2009. ^ "In pictures: The Bill's June Ackland". London: BBC News. 9 March 2007. Retrieved 17 November 2009. ^ "Alex Walkinshaw". Internet Movie Database. Archived from the original on 19 July 2009. Retrieved 17 November 2009. ^ "Simon Rouse". Internet Movie Database. Archived from the original on 4 August 2009. Retrieved 17 November 2009. ^ "My Yorkshire: Simon Rouse". Yorkshire Post. York. 9 June 2009. Retrieved 17 November 2009. ^ Graham, Alison (5 November 2008). "The Bill's DCI Jack Meadows". Radio Times. London. Archived from the original on 9 December 2008. Retrieved 17 November 2009. ^ "DC Mickey Webb (Character)". Internet Movie Database. Archived from the original on 23 February 2013. Retrieved 29 August 2010. ^ Revoir, Paul (27 March 2010). "ITV axes The Bill after 27 years as ratings fall". Daily Mail. London. Archived from the original on 3 August 2012. Retrieved 19 September 2010. ^ Unknown (23 January 2009). "The Bill to move to weekly slot". London: BBC News. Archived from the original on 26 January 2009. Retrieved 28 October 2009. ^ a b "Fire boosts The Bill's ratings". London: BBC News. 23 April 2002. Archived from the original on 8 May 2009. Retrieved 28 October 2009. ^ "Live Bill episode nears 10m mark". London: BBC News. 31 October 2003. Archived from the original on 16 January 2008. Retrieved 28 October 2009. ^ Holmwood, Leigh (24 July 2009). "ITV1's new-look The Bill drew 4.5m viewers last night but lost out to BBC1's New Tricks". The Guardian. London. Archived from the original on 3 April 2015. Retrieved 4 November 2009. ^ Cummins, Fiona (22 October 2009). "Black Thursday- 2m fans go as ITV switches Corrie & Bill". Daily Mirror. London. Archived from the original on 6 June 2011. Retrieved 28 October 2009. ^ Lister, David (18 March 2002). "The Bill arrests Decline". The Independent. United Kingdom. Archived from the original on 6 September 2012. Retrieved 4 November 2009. ^ "Weekly Top 30 programmes". United Kingdom: BARB. Archived from the original on 15 December 2012. Retrieved 4 November 2009. ^ "The Bill moves to 9 pm". United Kingdom: The Mirror. 22 January 2009. Archived from the original on 27 October 2010. Retrieved 4 November 2009. ^ "The Bill ratings". United Kingdom: BARB. Archived from the original on 15 December 2012. Retrieved 4 November 2009. ^ Jefferies, Mark (27 April 2009). "The Bill's Bafta win leaves ITV bosses red-faced after they axed half its episodes". Daily Mirror. London. Archived from the original on 26 August 2009. Retrieved 28 October 2009. ^ unknown (20 March 2008). "The Bill wins soap award battle". London: BBC News. Archived from the original on 23 March 2008. Retrieved 28 October 2009. ^ Pilkington, Diana (29 September 2009). "EastEnders tops the Bill for the Inside Soap awards – TV & Radio, Entertainment – Independent.ie". Irish Independent. Retrieved 29 April 2012. ^ "The Bill's Awards". UK: Internet Movie Database. 1984. Archived from the original on 6 April 2005. Retrieved 30 October 2009. ^ Swift, Lynn (2 March 2010). "Corrie misses out on RTS nomination". ATV. Archived from the original on 9 October 2011. Retrieved 4 March 2010. ^ "Lighting". 2009. Archived from the original on 10 May 2016. ^ "The Bill". Broadcast Freelancer. 16 July 2009. Archived from the original on 18 July 2009. Retrieved 18 November 2009. ^ "Merseybeat". TV.com. Archived from the original on 22 January 2009. Retrieved 18 November 2009. ^ "Merseybeat". Online Video Guide. Archived from the original on 21 July 2009. Retrieved 18 November 2009. ^ Billen, Andrew (16 December 2002). "New Statesman". London. ^ Shepherd, Robert (6 August 2008). "Holby Blue cops it as The Bill wins battle". London: Broadcast Now. Archived from the original on 30 September 2012. Retrieved 18 November 2009. ^ Conlan, Tara (6 August 2008). "BBC pulls the plug on Holby City spin off Holby Blue". The Guardian. London. Archived from the original on 15 July 2014. Retrieved 18 November 2009. ^ "The Bill criticised over MS plot". London: BBC News. 7 March 2008. Archived from the original on 15 March 2008. Retrieved 28 October 2009. ^ Revoir, Paul (2 July 2009). "The Bill's iconic theme tune scrapped after 25 years". Daily Mail. London. Archived from the original on 1 August 2012. Retrieved 28 October 2009. ^ Revoir, Paul (27 March 2010). "They've killed the Bill! ITV accused of sabotage as police soap ends after 26 years". Daily Mail. Archived from the original on 3 August 2012. Retrieved 6 May 2012. ^ Writer Haldane Duncan EMAIL MORE ARTICLES. "Part 11: The Cologne Diaries | TV Heroes". Transdiffusion.org. Archived from the original on 20 December 2008. Retrieved 2 March 2009. ^ "Pick of the box; Burnside's back on the beat". Daily Record. 6 July 2000. Retrieved 6 May 2012. ^ Purnell, Tony (26 April 2003). "The Bill special: Getting shot of Tony; Tony O'Callaghan is glad to have got the bullet after 12 years in The Bill because it means he can now spend more time with his baby daughter, Molly". Daily Mirror. Retrieved 6 May 2012. ^ Marlow, Wil (10 July 2005). "Diane living life at the Sharpe end …". Western Mail. Retrieved 6 May 2012. ^ &#8250 Tony Lynch. The Bill Annual: Amazon.co.uk: Tony Lynch: Books. Amazon.co.uk. ASIN 0862276756. ^ The Bill, The: Amazon.co.uk: Tony Lynch: Books. Amazon.co.uk. ASIN 185283157X. ^ Hilary Kingsley (Author). The "Bill": The First Ten Years: Amazon.co.uk: Hilary Kingsley: Books. Amazon.co.uk. ASIN 1852839112. ^ Sliver, Rachel (1999). The Bill: The Inside Story. HarperCollins Entertainment. ISBN 978-0-00-257137-1. ASIN 0002571374. ^ Lock, K.M (2000). Burnside: The Secret Files. HarperCollins Entertainment. ISBN 978-0-00-710719-3. ASIN 0007107196. ^ Tibballs, Geoff (2003). The Bill The Complete Low-Down on 20 Years at Sun Hill. Carlton Books Ltd. ISBN 978-1-84442-985-1. ASIN 1844429857. ^ Tibballs, Geoff (2004). The Bill The Official History of Sunhill. Carlton Books Ltd. ISBN 978-1-84442-667-6. ASIN 184442667X. ^ The Bill: The Official Case Book: Amazon.co.uk: Geoff Tibballs: Books. Amazon.co.uk. ASIN 1844421732. ^ Cole, Graham (2009). On The Beat: My Story. Splendid Books Limited. ISBN 978-0-9558916-2-5. ASIN 0955891620. ^ Burke, John (1985). The Bill: No. 1. Thames Methuen. ISBN 978-0-7493-0277-1. Archived from the original on 11 October 2008. Retrieved 16 November 2009. ^ Burke, John. The Bill: No. 2. Thames Mandarin. ISBN 978-0-7493-0278-8. Archived from the original on 11 October 2008. Retrieved 16 November 2009. ^ Burke, John (1989). The Bill: No. 3. Thames Mandarin. ISBN 978-0-7493-0002-9. Archived from the original on 11 October 2008. Retrieved 16 November 2009. ^ Burke, John. The Bill: No. 4. Thames Mandarin. ISBN 978-0-7493-0374-7. Archived from the original on 11 October 2008. Retrieved 16 November 2009. ^ Burke, John (1991). The Bill: No. 5. Thames Mandarin. ISBN 978-0-7493-0842-1. Archived from the original on 11 October 2008. Retrieved 16 November 2009. ^ Burke, John. The Bill: No. 6. Thames Mandarin. ISBN 978-0-7493-1178-0. Archived from the original on 11 October 2008. Retrieved 16 November 2009. ^ John Burke (Author) (1992). The Bill: Amazon.co.uk: John Burke: Books. Amazon.co.uk. Retrieved 13 August 2014. ^ Tough Love ("The Bill"): Amazon.co.uk: Dave Morris: Books. Amazon.co.uk. ASIN 0140385169. ^ Junior ("The Bill"): Amazon.co.uk: Dave Morris: Books. Amazon.co.uk. ASIN 0140385150. ^ "The Bill 'Overkill' by Mogan Pask single vinyl". Oxfam. Archived from the original on 23 April 2013. Retrieved 31 January 2013. ^ "Theme From The Bill". Archived from the original on 16 May 2015. Retrieved 31 January 2013. ^ a b c d e f g h i "The Bill Merchandise". thebillshop.com. Archived from the original on 19 November 2008. Retrieved 31 January 2013. ^ a b c "The Bill Merchandise 2". thebillshop.com. Archived from the original on 6 February 2003. Retrieved 31 January 2013. ^ a b "The Bill Merchandise 3". thebillshop.com. Archived from the original on 20 June 2003. Retrieved 31 January 2013. ^ a b c "The Bill Merchandise 4". thebillshop.com. Archived from the original on 5 March 2005. Retrieved 31 January 2013.